Mix all the ingredients thoroughly exept egg and roasted gram flour. Beat egg, fry half into kind of scrambled egg. Add it to the keema mix. Mix the remaining half beaten egg to the mix and also the gram flout. Marinate it in kitchen for 2-3 hours. 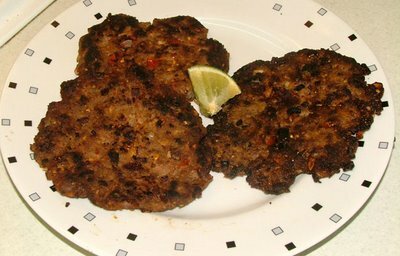 Roll the kabab mix into a paratha type thingee and shallow fry till dark brown. Serve hot with nan bread.